Brushed finished 18kt rose gold case, bezel & bracelet with polished finished beveled corners. Black ceramic crown with a brushed rose gold center & an engraved AP logo. Rose gold toned Mega-Tapestry "waffle" design textured dial. Applied rose gold rimmed Arabic Numeral hour markers with black luminescent fill. Flat black inner bezel flange with fine white printed minute/seconds, fractions of a second & Tachymeter scale. 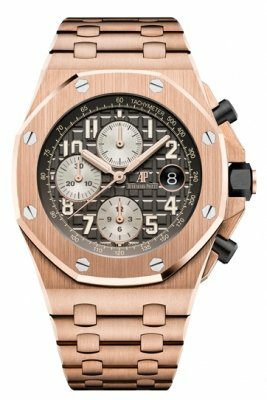 Thin rose gold rims encompassing the sub-dials. Black with very fine concentric circle pattern texture. 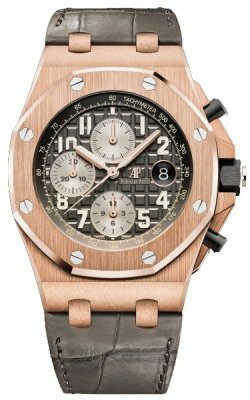 Rose gold Royal Oak baton hour & minute hands with black luminescent fill. 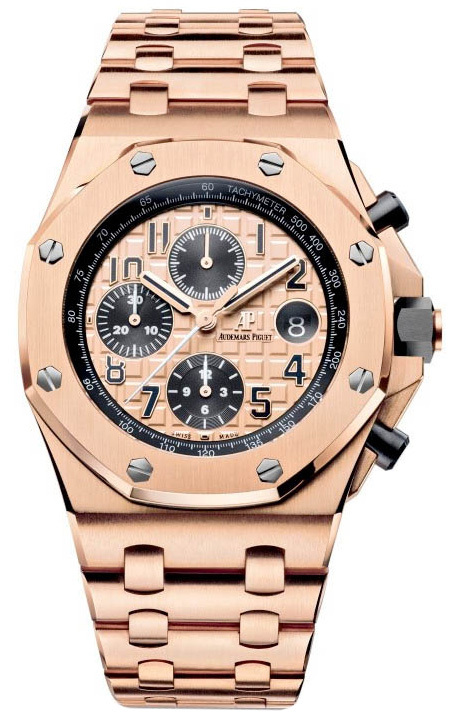 Small seconds sub-dial at the 12 o'clock position with a rose gold hand. I just took delivery of this watch (Thank you, Prestige Time). All I can say is WOW WOW WOW. This watch is not for the faint of heart. It weighs a ton, not for nothing is it known as "The Brick". Despite its weight the watch sits well on the wrist. This watch is a show stopper!